After a week of urging by Puerto Rican officials and the likes of Senator John McCain in D.C., President Trump has waived a nearly one hundred-year-old law which made it more expensive to ship much needed supplies to the hurricane-ravaged territory. The Jones Act, otherwise known as the Merchant Marine Act of 1920, requires that goods shipped within the United States be carried by vessels built, owned, and operated by Americans. Citizens of far-off U.S. regions like Hawaii, Alaska, and Puerto Rico have long complained that the law makes it prohibitively expensive for them to purchase common goods, because these American ships can command higher rates than foreign vessels. The government originally passed the law to support America's seaships for commerce and possible military need; its present day supporters champion it as a beacon for patriotism. Waiving the Jones Act represents President Trump's most high profile action to date to address the humanitarian crisis unfolding in Puerto Rico, which was devastated by Hurricane Maria over one week ago. On Twitter, where the President's priorities are on most direct display, Trump has put a much larger emphasis on NFL players taking a knee than Puerto Rico's exigent concerns. As of Tuesday, he had tweeted 24 times about the NFL, to just four times about Puerto Rico. Jones Act apologists say that waiving the law will have little effect on Puerto Rico's fortunes, and that the primary bottleneck in delivering aid has been transport inland, rather than to the Puerto Rican ports. Indeed, Puerto Ricans are in dire straits, with rampant reports of lack of basic necessities like water, tarps for roofs, and gas for stoves. Lines stretch all night for ice, which then quickly melts due to lack of electricity. Managing the response to this crisis will be yet another test of leadership and legacy for President Trump. So far, those with experience in these sorts of events say Trump's actions have been insufficient. The retired army lieutenant general Russel L. Honoré, who President Bush brought in to remedy his botched efforts during Hurricane Katrina, told Bloomberg News that Trump should immediately move 50,000 troops to the island, or else face dire repercussions. 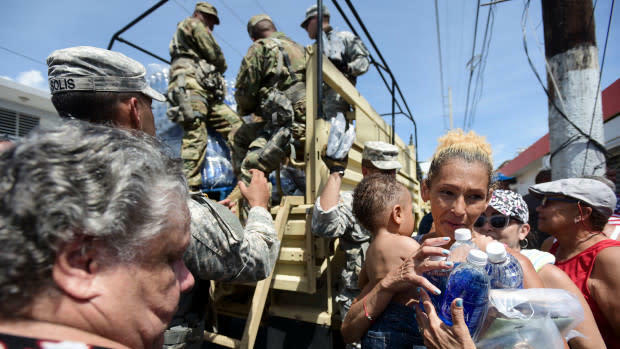 At present, there are 7,200 federal troops on Puerto Rico. In a recent press conference, Sarah Huckabee Sanders, the White House press secretary, vowed to Puerto Rico's residents that "we will not let you down."